The aviation industry is a relatively sensitive industry as fuel costs, weather and other external factors could affect the passenger demand. However, in the past few years, the global economy has grown steadily, as the oil prices and interest rates have held at relatively low levels, and the passenger flow, load factor and profit are strong for the global airlines industry. What will happen to the industry in 2019? Here are some of the most eye-catching aviation stories that could be expected this year. The International Air Transport Association (IATA) said in its latest report that the lower oil prices and solid, albeit slower, economic growth are extending the run of profits for the global airline industry, after profitability was squeezed by rising costs in 2018. 2019 will be the 10th year of profit and the fifth consecutive year where airlines deliver a return on capital that exceeds the industry's cost of capital. IATA forecasts the global airline industry net profit will be $35.5 billion in 2019, slightly ahead of the $32.3 billion expected net profit in 2018. In further detail, Asia-Pacific carriers are expected to report a $10.4 billion net profit in 2019, up from $9.6 billion in 2018. In terms of China, the three listed carriers, Air China, China Southern Airlines, and China Eastern Airlines have all reported windfall revenues in the first three quarters, as the three airline giants' revenues hit nearly 300 billion yuan ($43 billion), led by 108.89 billion yuan for China Southern. IATA said lower fuel costs, low levels of fuel hedging and strong regional economic growth would support profitability in 2019 in the Asia-Pacific region. Effective Tuesday, China Southern Airlines would not renew its contract with SkyTeam, the global airline alliance, to "meet the needs of the company's own development strategy and the changing trends of the global aviation industry," the airline said in a statement in November 2018. SkyTeam is one of the world's three major global airline alliances including a number of major airlines. Rival alliances include the Star Alliance and Oneworld. The alliances provide reciprocal benefits for passengers such as lounge usage and frequent flyer points. Actually, it is not the first time a carrier has withdrawn from their alliance, and it has been a growing trend to see more and more airlines willing to strike deals outside their alliances. In March of 2017, American Airlines invested $200 million in China Southern, and in the same month, Hong Kong-based Cathay Pacific and Lufthansa Group, Europe's leading airline group, announced that they had reached a code-share deal to offer passengers selected flights under each other's flight numbers. American Airlines and Cathay Pacific are founding members of the Oneworld alliance, yet Lufthansa is a member of Star Alliance and China Southern is a member of SkyTeam. These examples of cross-alliance cooperation also mean that the airlines are putting their own interests ahead of their alliances' interests. 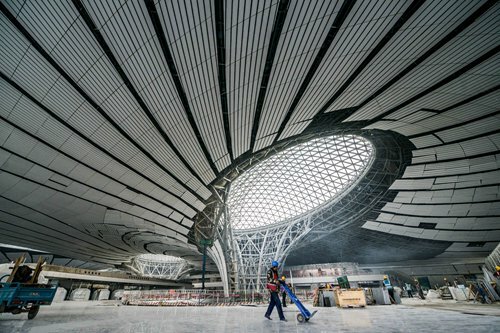 Beijing Daxing International Airport, a multibillion-dollar project that is located on the border of Beijing and Langfang, North China's Hebei Province, is under final construction and is expected to open in September this year. The airport has been under construction since 2014, and is designed as another international gateway, in addition to Beijing Capital International Airport, which is currently running at maximum capacity. Once finished, it will have the capacity to accommodate 72 million passengers and 2 million tons of cargo, on an annual basis by 2025. That, together with the existing Beijing Capital International Airport's annual capacity of 96 million passengers, would make Beijing one of the world's busiest city airport systems. This would be similar to the volumes handled by London's six airports of 170 million, based on 2017 figures, according to a report from the New York Times. In the longer term, the airport sets its goal at 100 million passengers and 4 million tons of cargo every year. 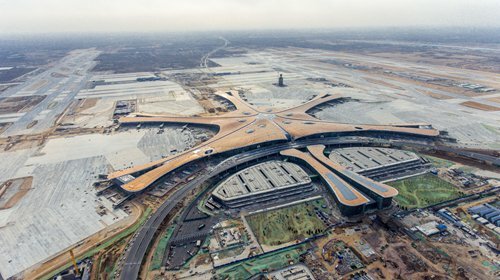 The airport features a large ground transportation center that will link the new airport to public transportation systems including Beijing's metro, the high-speed rail network and expressways, according to its official WeChat account. Shanghai-based China Eastern Airlines, along with China Southern Airlines, will be moved into it as scheduled this year, and by 2025, China Southern also aims to introduce a further 250 aircraft to Beijing's new airport and operate more than 900 flights on a daily basis. Certain foreign carriers such as Delta Air Lines, Korean Airways and Air France KLM will also be based at the new airport. 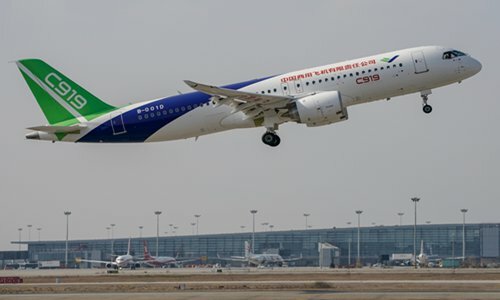 Commercial Aircraft Corporation of China (COMAC) will strengthen its research and test processes for its C919 prototype passenger jet in 2019, with three more C919 prototypes expected to make their maiden flights within 2019, according to a report from the Xinhua News Agency. With a range of 4,075 kilometers, China's homegrown C919 jet is considered as a competitor to the updated Airbus 320 family and Boeing's new generation 737. The first and second C919s made their maiden flights in May and December in 2017, respectively. They are currently conducting test flights at various Chinese airports. Recently, a third C919 jet completed its maiden flight after landing in Shanghai Pudong International Airport on December 28. After the first flight, the prototype will also conduct test flights in Xi'an, Northwest China's Shanxi Province, with a focus on flutter, speed adjustment, load, control and performance.